Shaped handle set brushes are the same as block brushes with a shaped handle on the end opposite the brush. These handles are typically made of wood or injection molded plastic. 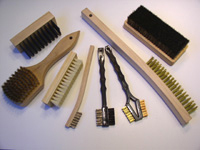 The handles may be made in a multitude of shapes and sizes and can be filled with any type of bristle. Contact us for assistance in custom designing this type of brush.